Rochester, N.Y. – Semrock, Inc., the leading manufacturer of high-performance optical filters for the biotech and analytical instrumentation markets, today introduced a new family of hard-coated BrightLine® fluorescence filter sets tailored specifically for clinical laboratories. 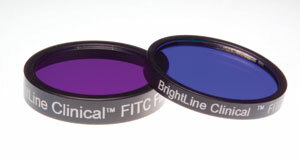 BrightLine Clinical™ hard-coated fluorescence filter sets combine the proven durability of the famous research-grade BrightLine filters with optical performance exceeding that of even premium soft-coated fluorescence filters – yet at the strict entry-level price required by the cost-conscious clinical market. Further, the "no burn-out" feature of BrightLine Clinical filters – common to all BrightLine filters – not only significantly lowers the total cost of ownership, but now ensures medical and clinical laboratory users of reproducible measurements year after year. "In recent field trials at three hospital clinical laboratories independent experts were dazzled by the superior brightness and contrast of these patent-pending BrightLine Clinical sets compared with even premium soft-coated filters," reports Dr. Turan Erdogan, CTO of Semrock. BrightLine Clinical filter sets are in stock for the popular FITC fluorochrome, for popular immunofluorescent tests based on blue excitation and green fluorescence, and the Calcofluor White fluorochrome, used in a wide variety of mycological and fungal staining tests and kits. For each fluorochrome, two different types of sets are available: a long-pass-emitter set for the highest brightness and counterstain visibility, and a bandpass-emitter set for maximum contrast. Semrock first improved the premier Ion Beam Sputtering (IBS) filter manufacturing process to introduce the now-patented BrightLine research series of high-end fluorescence filters, thus establishing the standard in optical filters for research microscopy. Now, after many years of continuous development, Semrock has made it possible to tailor the sophisticated IBS technology to the far more cost-conscious clinical microscopy market. "This inclusion of the mainstream has long been a strategic goal for Semrock, and represents a important expansion of the company's market," says Dr. Victor Mizrahi, President & CEO of Semrock. "I am also personally proud that our team has made it possible to significantly enhance the critical testing done by medical and clinical laboratory users."